Purveyor of melancholy cartoon moments, amorphous shape and line, melting abstract symbolism and form fluidly, Arturo Herrera creates new meanings from global popular culture and the discarded memories available at thrift stores. With gorgeous abstract dialogue, he cuts into our subconscious, seeking dark realities in the seemingly innocent imagery of childhood. Yet this is globally corporate sentiment which he makes us aware of; in homage to past Modernist movements, he hopes to awaken our senses from the dreamy haze they reside. References to Pollack appear as dripping webs of networked possibilities in immigration halls, allowing art to be the key to success in the cutthroat Americas. Simple gestural brush strokes, epic in scale on institutional walls, have the purity both the Ab Exs and cartoonists long for. With clear precision and acute awareness, Herrera depicts the line between the Surrealistâ€™s dream and the failure in Dada. Partaking, we become the tight rope walker and must balance accordingly between his worlds and Artâ€™s past. 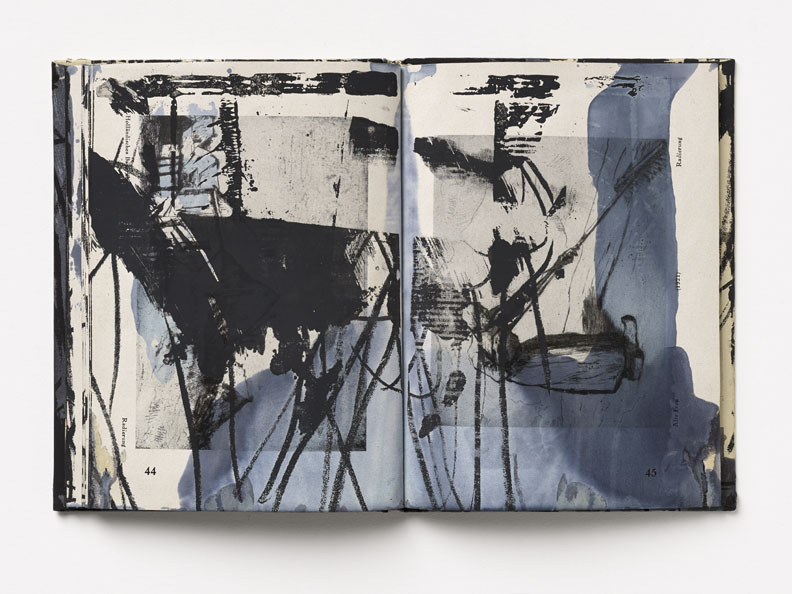 For his upcoming exhibition at Corbett vs. Dempsey in Chicago this December, he reveals new work within the intimacy of the printed book; showcasing several altered found books in a sensibility all his own; muted yet powerful, melancholic yet strong, abstract yet concrete, visceral, tangible. In this, he enlivens us to the subjugation our senses experience in the digital age. I had the pleasure of meeting and speaking with Arturo this Fall during his visit to Cranbrook Academy of Art, in Bloomfield Hills, MI. Graphiker der Gegenwart â€“ Lesser Ury Lothar Brieger, silkscreen and mixed media on paper. 7.9 x 5.9 x 0.3 inches. CourtesyÂ of the artist. Tom Friel: You donâ€™t seem to deny the narratives of your source material, but instead keep an emotional or subconscious link to the meaning of the original imagery while altering the visual elements through college and abstraction. Does a process like this ultimately aim to create new stories or truths? Could your invented meanings become equal with the original, and if so, do they become a part of the narrative from the source imagery? Arturo Herrera: Using everyday printed materials which are instantly recognizable leads the viewer directly into the image and at once a connection is established. Crashing our invented, private meanings onto a newly constructed image only adds to the impact of the original source. This undoing of linearity is attractive to me. AH: The recent works ‘Richard,’ ‘Giuseppe,’ and ‘ Johannesâ€˜ are three mixed media editions I made for Pace Prints in 2012. That same year I had the solo shows called Series at Corbett vs Dempsey in Chicago and at Thomas Dane in London. My intention with that body of work was not to overwhelm the audience with information but a way of exposing a personal lexicon. To put it all out there if you wish. The goal was to make something polluted and non hierarchical. It dealt more with wanting to see what a disintegration of my own sources could look like. I guess it is an organic process that every artist goes through. TF:Â An overload via critical mass. They are quite nice, and I guess I was curious also because of how successful these, and other highly intricate works are that you have recently completed. Maybe its the control you have over the collage process that allows for so much to happen in one work and it not be too much, but Â just perfect. It seems there are a lot of formal discussions you wish to engage with the work, like engaging the medium or the visual qualities of abstraction. While collaging is a piecing together of disparate images and meanings to create new meanings, we approach abstraction as a collage our brains compose. In other words, we often try to create concrete images out of the abstractions, like Rorschach tests. Having experienced abstraction in art for so long, we tend to allow abstraction to remain as these pure visual and undefinable moments.Â Elements of Abstract Expressionism, Minimalism, and Pop can be found in your work. So often, we try to define artists by their relationship to art of the past. While many people may respond to art in this manner, it can dominate the conversations around the work. Is this something that is interesting to you, or do you find the comparisons to derail broader meanings of the work? 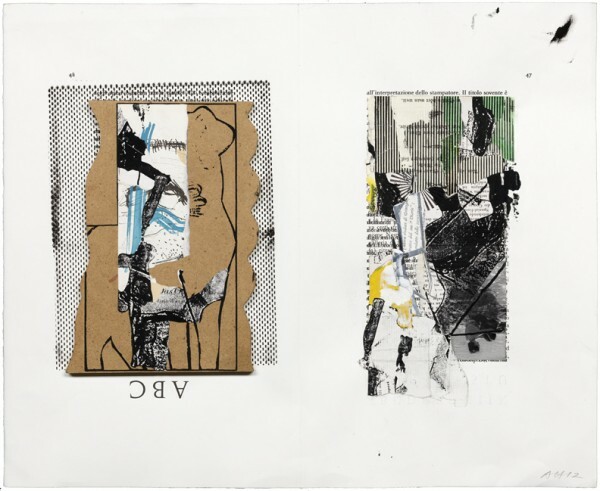 Arturo HerreraÂ Ariadne auf NaxosÂ 2012,Â collage and mixed media on paper,Â three elements, 25 1/4 x 19 1/2 inches each. Courtesy of the artist. AH: Even though I am interested in all those movements especially modernist painting, surrealist collage, abstract expressionism, and pop art not very many people have discussed that aspect of the work in depth. The earlier texts hovered around childrenâ€™s fairy tale and the psychoanalytical subconscious. At the moment the discussions deal more specifically with abstract painting and its references and the continued impact of collage in today’s contemporary art practice. TF: Many of your older works utilize cartoon imagery in them, or reference cartoons through a similar line quality; fluid curvilinear lines which undulate and ooze, they drip and tumble around the page in an abstract free fall of white gloved hands morphing into a propellor or a bulbous nose. These increasingly abstract works strongly reference one of the more common and beloved cartoons cliches: the cloud surrounding a cartoon brawl, with arms and noses peeking out in what is an otherwise hard to visually explain mess of action, passion and ecstasy. Locating your composition in one still image instead of many animated cells, the undefined moments of action wage without clear understanding of whose limb is whose. So, almost lifted directly out of the very cartoons is a scene which your work often explores, the familiar returning to the unfamiliar. This is a very important element of your work, the sense of subverting established cultural entities, like Disney cartoons. It also lends itself to the uncanny, which I donâ€™t think youâ€™ve ever talked about concerning your work. AH: Collage combines dislocated fragments that usually generate irreverent images full of irrationality. No uprooted source that has been cut, juxtaposed and glued into a new visual entity remains the same. Some of my works play with violence, sexuality and absurdity. It is important having these as borders of psychological interaction. It brings an unexpected, latent meaning to an established/familiar cultural icon and that contributes to the resonance of the work. TF: You have described your initial involvement with collage as a means to create art without much money, space or many materials. At this point though, you have defined a practice within it, and so it seems you have come to embrace collage wholly! In addition, you have done many wall paintings and felt pieces; the felt works being increasingly sculptural. Are there other mediums now that your circumstances are different you would like to invest your time in more, or does the immediacy and directness of collage make it the perfect medium for you? AH: I started working with paper when I first moved to NY in the late 80â€™s. It was the ideal medium because it was easily available and inexpensive. It was incredibly fast to make collages and it allowed the small working area to be relatively clean and free of toxic fumes. I was fortunate later on that I had the chance to work with painted MDF, raw steel and photography. Right now I am painting with oils on canvas and on linen. It is amazing how different and slow the process is. I have been changing gears lately and the challenge is invigorating. Arturo HerreraÂ StampatoreÂ 2012,Â collage and mixed media on paper,Â 14 x 17 1/4 inches. Courtesy of the artist. TF: Books have a visceral connection to us that many other objects do not. They are both precious and pulp repositories of ideas and culture, high and low. Their rich history inÂ human development and civilization contribute to a realness and visceral quality. Its such that, abandoned books can carry the sense that their ideas and information contained within are obsolete or out of fashion, even if that isnâ€™t truly the case. With the decline of printed books, your sense of the obsolete is pointed. Its almost as to keep these objects alive in the present, we need to alter them in ways that we can feel or sense beyond the LED or LCD screen. There is such a different relationship to using a Kindle or laptop to read a book, that having that physical presence altered, makes us aware of the distance we have created and slowly removed ourselves from. Though the Kindle tries to recreate the experience of a physical book, it loses the character and intimacy. Can you give a preview of your upcoming exhibition this December at Corbett vs. Dempsey? AH: The new show at Corbett vs Dempsey consists of found books that have been silkscreened painted, stained and /or painted. There are sixty books in the series grouped in six boxes of ten books each. By obliterating their content, I destroy their original function while transforming them into something entirely different. These discarded paperbacks and hardcovers become new again as constructed artworks. They continually refer back to their origins while proposing multiples readings on history and art, the obsolete and the fetish, the precious and the abject. I had the pleasure of meeting and speaking with Arturo this Fall during his visit to Cranbrook Academy of Art, in Bloomfield Hills, MI.Â Â Thanks to Arturo Herrera for his time in the many stages of this interview. His kindness and warmth are much appreciated. Also thanks to Julia Hendrickson and Corbett vs. Dempsey, Sarah Turner and Trisha Holt of Cranbrook Academy of Art for their help; without them, this interview would not have been possible.